How Do I Fix My Chicken Soup If It Has No Flavor? Bland chicken soup may be good for the body, but it’s hardly good for your taste buds. From simple to savory, there are as many methods for flavoring the soup as there are recipes for the soup. The key is to taste the soup as you go so you avoid over-seasoning the broth. Once the soup is over-seasoned, it’s typically beyond saving. Adding some body to bland chicken soup can be as easy as sprinkling the right seasonings into the broth. A staple seasoning for any chicken soup is salt, which helps enhance any flavor in the soup. Mildly hot spices that pair well with chicken soup include black pepper, white pepper, garlic powder, onion powder and cumin. Fiery spices that bring out the flavor of the soup include red pepper, cayenne pepper and hot paprika. Smoky spices that bring a woodsy flavor to the soup include smoked chipotle powder, smoked paprika and smoked salt. Herbs are a standby when it comes to fixing a flavorless chicken soup. Two classic herbs for chicken soup are parsley and basil, both of which have a mellow and almost sweet flavor. Sharper herbs that pair well with chicken soup include oregano, marjoram and thyme. Rosemary works well if you want a slightly piney flavor in the broth and sage adds a slightly bitter twist. 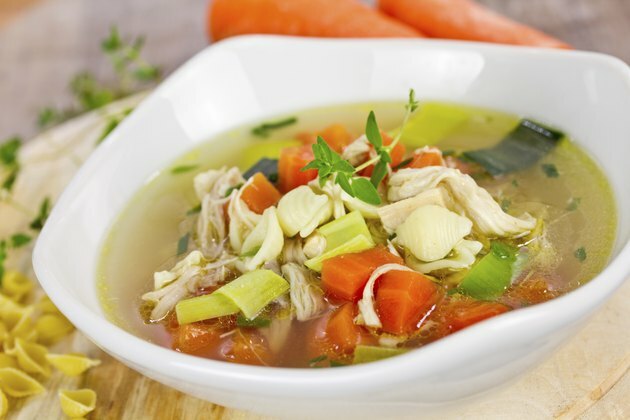 Vegetables add flavor, color and texture to a boring chicken soup. Stir diced carrots or celery into the soup to add a sweet undertone and some color. Try diced tomatoes or sun-dried tomatoes for a tangy taste. Add potatoes or kidney beans to the broth to create a mellow starchy flavor. Use sweet peas or diced green beans to bring an earthy sweetness to the soup. Add any kind of onion, green or white, to add a sharp taste to the broth. You don’t have to stick to just one category of ingredients to add flavor to a bland chicken soup. Combining different vegetables, herbs and spices is the secret to creating a tasty soup with a complex flavor. Stir parsley, basil, black pepper, garlic powder, salt, celery and onions into the soup for an Italian-style kick. Combine black pepper, cayenne pepper, thyme, onions, celery and carrots to create a Cajun-style soup. Add potatoes, rosemary, kidney beans and salt to the soup for a hearty taste. Mix onion powder, smoked salt, smoked chipotle powder, sun-dried tomatoes and celery into the soup for a woodsy flavor. Is Soup Good for You When You Have a Fever?